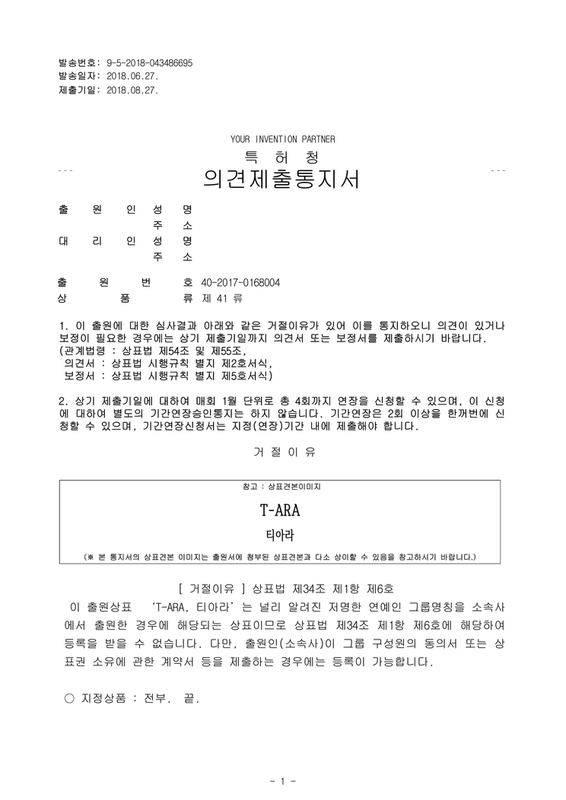 On June 27th, KIPRIS (Korea Intellectual Property Rights Information Service) published a Notification of Reason for Refusal to MBK Entertainment's class 41 (entertainment) trademark application of T-ara's name. The Notification indicates that as per Article 34 Section 1 Item 6 of the Trademark Act, the trademark for T-ara, a well known celebrity group, cannot be registered. Article 34 Section 1 Item 6 of the Trademark Act states a trademark that consists of the name, title, portrait, signature, seal/stamp, literary name, pen name, stage name, of a prominent person cannot be registered. Registration can only be possible if the applicant (MBK Entertainment) submits an agreement from the group members for the trademark. The legal status of the applicant still remains Under Examination. A final verdict will be made if the applicant submits no further documents in 3 months time. Previously, MBK Entertainment's trademark application for classes 03 (cosmetics, laundry formulations, etc. ), 25 (clothing, footwear, hats), 09 (science, photography, educational equipment) were refused as well. Interesting! Looks like this increases the chances of T-ara performing together, using the T-ara name/songs, and signing up as T-ara under a new record company. I'm not familiar with the current T-ara situation exactly. Do the four members want to continue releasing music as T-ara, or are they "unofficially" disbanded? Please tell me also what Boram and Soyeon are up to! Sounds like if MBK doesn't have any more evidence, in 3 months MBK will be refused the right to trademark. Is there any news if the girls will put a trademark request in or not? Actually they are not disbanded and they are already saying it multiple times. The 4 girls still stick together. and I believe Ssoram will join em too since they promise us that they will return. and if you pay attention to soyeon recent update you will get it that she miss the stage and singing some song. Unfortunatly boram has not update for a long time and we know nothing about her for now the rest of the member done some variouse Thing for example Jiyeon and hyomin will have solo comeback (2nd solo for ji and 3rd solo for Hyomin) & Eunjung have role in a new drama and Qri hanging out with her mother and friends this is our current girl's situation and since this trademark battle reaching the current situation I think we can hope for much more good news pretty soon. All the thing we have to do is keep trusting and believing our girls that what they want from us so let give it to them. Gath it looks like the four T-ara members are trying to get legal rights to perform as T-ara and apply for a trademark request or something. DaniDante I had a lower quality version of that pictures. On Google Images you can "Search By Images" and upload an image to search for. I uploaded the lower quality version and found that a higher quality version was online now. You can do that for various pictures. You can find various pictures from the same photo shoots, and find out information about photos you may have of as well. This is one of T-ara's best photos and would be great as a poster!